UPDATED: May 7, 2014, at 12:09 a.m.
After four years of research and drafting by the Academic Integrity Committee, members of Harvard’s Faculty of Arts and Sciences approved the College’s first-ever honor code at their final regular monthly meeting of the year on Tuesday, laying out formal expectations for academic integrity and creating a new student-faculty/administrator judicial board to hear cases regarding the violation of those expectations. 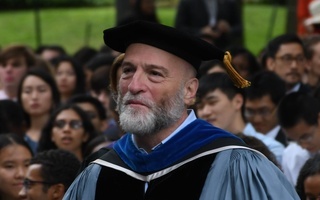 Likely beginning in the fall of 2015, all College students will be required to make a regular affirmation of integrity, the nature and frequency of which will be determined next year, according to Dean of Undergraduate Education Jay M. Harris. Incoming Dean of the College Rakesh Khurana will recommend specific logistics concerning this affirmation to the Faculty Council, and subsequently the full Faculty will vote on the final details. 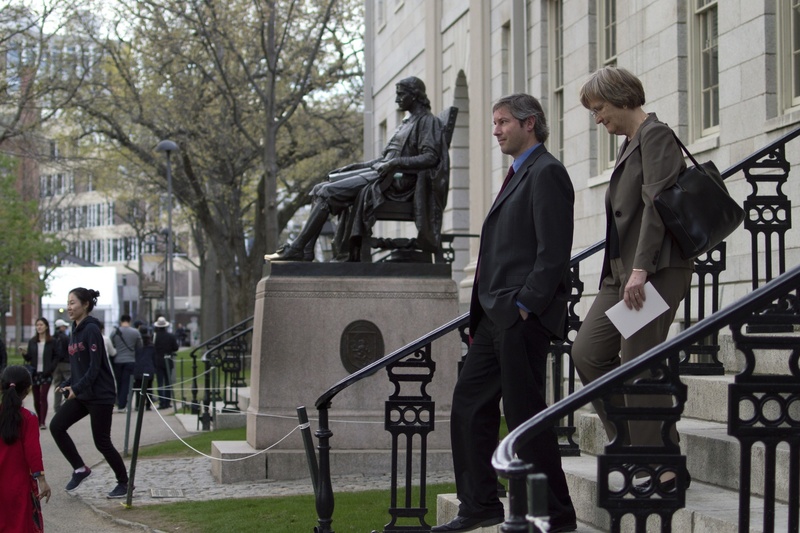 Harvard President Drew G. Faust leaves University Hall in May 2014 after the last regular meeting Faculty of Arts and Sciences meeting of the year, during which the body approved the College's first-ever honor code. Undergraduate Council Vice President Sietse K. Goffard ’15, who served on the Academic Integrity Committee for two years and voiced his support for the honor code at the meeting on Tuesday, said the vote marks an important step in a longer process. “The impact will probably be small, but I think over time it will help to create that culture shift where people really value academic integrity and personal integrity,” he said. The Committee on Academic Integrity will continue to meet in the coming academic year to discuss the implementation of the honor code. “Our hope is that in the coming years that the code catalyzes hundreds of conversations and reminds us of what it means to be part of the Harvard College community,” incoming Dean of the College Rakesh Khurana wrote in an email Tuesday. With this significant policy shift, Harvard joins a long list of peer institutions who already have similar systems regarding academic integrity. Yale now remains the only school in the Ivy League without an honor code. The honor code, the first in Harvard’s 377-year history, also includes the creation of the Harvard College Honor Board. Unlike the Administrative Board, the body that currently hears such cases, the new honor board will include student members, in addition to resident deans, other faculty, administrators, and graduate students who have served as teaching fellows. The Dean of the College, or the dean’s designee, will serve as chair of the board, according to the approved proposal. Tuesday’s meeting marks the fourth time members of the Faculty have gathered to discuss the honor code over the past two years, following several discussions during which professors expressed concern over the potential impact of the policy and its ability to change the campus culture toward cheating. Members of the Faculty Council voted 13 in favor and two opposed to the new honor code at their April 30 meeting. 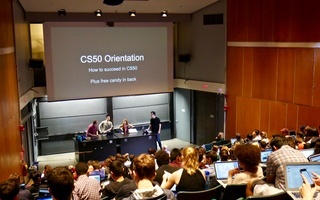 Although faculty members spoke and voted overwhelmingly in favor of the new policy, which was presented by Harris, who chairs the Academic Integrity Committee, some professors who spoke during the meeting said that they are unconvinced that the affirmation of integrity is an effective means for curtailing the problem of cheating at Harvard. "I haven’t heard the evidence that the device that is proposed here gets at the problems at hand," said Computer Science professor Harry R. Lewis ’68, former Dean of the College. Faculty members will discuss a proposed student honor code, the passage of which would require students to make an affirmation of integrity, at their monthly meeting Tuesday. The legislation will likely go before the full Faculty for a vote next Tuesday.